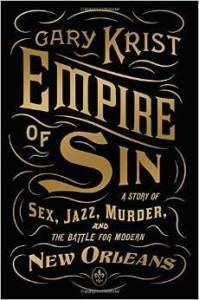 Empire of Sin re-creates the remarkable story of New Orleans’ thirty-years war against itself, pitting the city’s elite “better half” against its powerful and long-entrenched underworld of vice, perversity, and crime. This early-20th-century battle centers on one man: Tom Anderson, the undisputed czar of the city’s Storyville vice district, who fights desperately to keep his empire intact as it faces onslaughts from all sides. Surrounding him are the stories of flamboyant prostitutes, crusading moral reformers, dissolute jazzmen, ruthless Mafiosi, venal politicians, and one extremely violent serial killer, all battling for primacy in a wild and wicked city unlike any other in the world.